Description: We talked to the crew for a little wile and they where very nice to us. 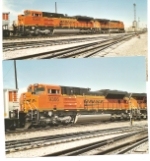 BNSF crews are very nice to Railfans. Description: 5 different types of EMD engines in 7 different paint schemes meet at Eola, not bad! Description: BNSF train U-SWEMCI snakes into the yard to set out a few bad orders. Description: The power for BNSF train U-SWEMCI is captured in nice low afternoon light. Description: U-SWEMCI enters LaCrosse Yard to set out a few bad order cars. Title: BNSF 9811 a Cream n Green mac on the lead of a empty coal. Title: That's all for now. Description: I'm way behind in uploading, have pics of at least 7 trains to upload.